1 = no change (this is the default). 2 = More contrast: Louds become very loud. Quiets become very quiet. 0.5 = Make the quiets a bit louder, and loud volumes a bit quieter. 0 = Force the music to the same volume. -1 = Loud volumes become soft, and soft become loud! For technical reasons, you may need to increase or decrease the standard volume to counteract the side effects of this volume contrast function. For example, if you set the Vol contrast to 0.5, then all volumes converge half way to maximum volume, so make sure you also set the 'normal' Volume control to around 0.5 to compensate for the effect. On the other hand, if you set the Vol contrast at 2, you'll probably want to increase the 'normal' Volume somewhat to compensate. Improving the music by making it faster, slower, higher, or lower. Instrumentalists can force a piece slower so they can practise playing along. Singers can experiment with different transpositions to see which best fits their voice range. As with the other slide functions, you can type any number into the field for greater range and accuracy than the slider would otherwise allow (fractional numbers included). Swap an instrument for another one, or change the volume of an instrument! 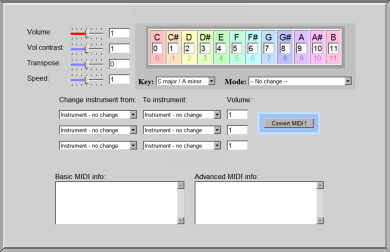 You will need to make sure you pick the right instrument to change from, so if you wish to see what instruments the MIDI originally used, look in the "Advanced MIDI info" box. You may want to focus on certain instruments without the obstruction of others (volume can bet set to zero which effectively turns them off). Alternatively, you may want to hear Beethoven's Violin Concerto but with tubular bells instead! If you are changing the volume, make sure that the instrument you're adjusting is in the "Change instrument from:" column, and not the "To instrument:" column. Experiment with the dozens of predefined modes or create a brand new one! Find out what Paul McCartney's 'Yesterday' or Mozart's 'Eine Kleine Nacht Music' sounds like in a minor key! How about a medieval or blues version of Abba's 'Dancing queen' or Gershwin's 'Rhapsody in Blue'? This functionality of MIDItransform is the most fun to mess about with and is unique to this software as far as I know. You'll notice that the numbers in the colored boxes change as you select one of the modes - each one representing the changed note. For example, 0, 1, 2, 3, 4, 5, 6, 7, 8, 9, 10, 11 corresponds to every note in the chormatic scale, and means no change, while something like: 0, 1, 2, 4, 4, 5, 6, 7, 9, 9, 11, 11 corresponds to the diatonic major scale (C, D, E, F, G, A, B) and thus transforms the piece into a major key. The 'key' or left dropdown menu is correctly calculated by the program 95% of the time, but occasionally it will make a mistake. If this happens, try looking at the 'rival keys' in the "basic MIDI info" section for the next closest key match. In any case, adjusting this only affects the music if one of the modes has been selected. Listen to the following selection of key changes! (for demonstration purposes only). The MIDItransform software and documentation is copyright Daniel White 2005+. All MIDI music featured in the conversion examples is copyright of their respective owners.